Two weeks ago the Veronica Mars movie came to select screens, delivered to us through the magic of crowdfunding wherein thousands of fans donated their own cash to get the movie made (full disclosure, I am one of those fans). It was quite easily predictable, then, that the movie was going to go to great lengths to satisfy those fans, to prove their money was worth it. Director and writer Rob Thomas was very aware of this, stuffing the movie with as many in-jokes, cameos, character returns and smoldering stares from Logan Echolls as it possibly could. But more importantly, just to get a usable plot, the film had to bring Veronica back to Neptune and her old life, so that it could tell a story that involves old faces and new murderers. On her way back to her P.I. roots and away from her cushy new New York life, Veronica had to make some bad (or at the very least, incredibly risky) life decisions, including blowing up a job offer that would promise stability, sanity and a life away from the 90909 zip code. Watching the movie, I couldn’t help but think of another cult show about a dedicated blonde woman living in a town that’s bad for her: Parks and Recreation‘s Leslie Knope. With a bit more comedic innocence, Pawnee, Indiana has put Leslie through the ringer just as Neptune, California has forever damaged Veronica. Leslie has been recalled from office, humiliated and degraded by Pawnee and some of its ridiculous citizens, all while constantly striving to make it a better place. Even with a character as endlessly positive as Leslie Knope, sometimes it’s a little hard to watch her take these beatings over and over again. An overriding theme of the show is how genuinely good a person she is, and Leslie may actually be one of the nicest characters on TV. Which is why the sudden appearance of a job offer from the National Parks Service a few episodes ago seemed like such a beacon of hope for her. There’s a big part of me that desperately wants Leslie to take that job, leave Pawnee and never look back. I want her and Ben to move on and have tiny nerdy children and live happily ever after. But Pawnee, with all its overlarge citizens and rabid possums is also the source of the off-beat brand of comedy that makes Parks and Rec so great. And to be totally honest, without Pawnee, there just isn’t a show. The National Parks job seemed just perfect enough that I went online to double check that the show was renewed, because Leslie moving away would definitely be a way to end it. A happily ever after is an ending, after all. It’s a wrap up to the troubles and conflicts that made the meat of the series. There’s nothing particularly exciting about everything working out. The same is true with Veronica Mars. If there are going to be anymore mysteries and adventures in Neptune then Veronica has to be living there, putting her sleuth skills to good use. It’s no secret that Thomas and star Kristen Bell want the franchise to continue, and even if there are no more movies or episodes, they have just published the first in a series of books. 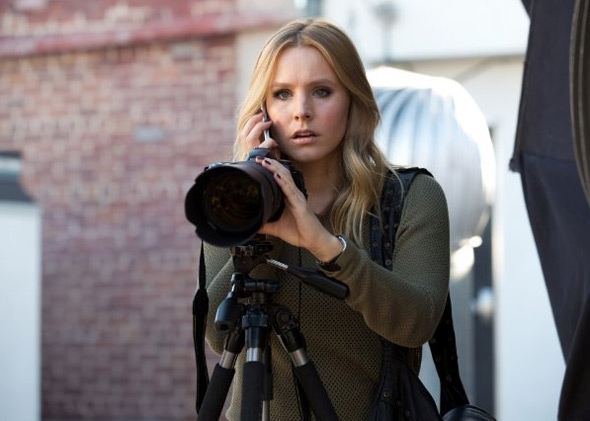 Veronica Mars, New York Corporate Lawyer doesn’t have quite the same ring to it as Veronica Mars, Neptune’s best Private Detective. But even though I want this story to continue enough that I was willing to put up my own money a year ago, it was so hard to watch Veronica literally ignore opportunity knocking when she kept silencing calls from her new law firm. I kind of wanted to scream at the screen. You went to law school for this reason! Don’t throw it all away! Of course calling Veronica’s choice to stay in Neptune and Leslie’s potential choice to stay in Pawnee (as of the most recent episode she’s still thinking) “bad life decisions” is inherently judgmental on my part. There is nothing to say that more happiness would be found for either character in the “good” choices. But the stories do set up these options as something that has the potential to be better, because experience has proven that it’s tough to be in Neptune and Pawnee. So why shouldn’t they just leave? Comparing Veronica and Leslie to a third blonde heroine with a “hell” of a hometown, Buffy Summers of Buffy the Vampire Slayer, the difference is that Leslie and Veronica have the choice to leave. Buffy had a duty as the mystical slayer, to stay in Sunnydale, California and guard the Hellmouth. Things would probably have been a lot better for her if she went away for college, but that wasn’t an option for her. And if you think about it, back when Veronica was in high school, she was stuck in Neptune because her father didn’t want to leave. Putting the choice in these protagonists’ hands creates this tension for the audience. Both Parks and Rec and the Veronica Mars movie have tried to dispel this tension by giving compelling reasons to keep these women close to home. After receiving the job offer Leslie headed to her trusty Ron Swanson to inquire why she can’t leave when Pawnee treats her so badly. He reminded her that she likes trying to fix Pawnee, in spite of everything it routinely throws at her. New York may have a job for Veronica but Neptune has Logan, and of course, all that corruption and mystery. It might be easy to leave, but Leslie and Veronica have things to do. And many, many more stories to tell. But I can’t be the only one wondering how Veronica is going to pay her law school loans? Right?